Last November, the world cup in a funny sport Headis, took place at Comenius University in Bratislava. It is played on a ping-pong table with a large ball. It would be a bit heavy for a LEGO robot, but your robot should be able to handle table-tennis balls with ease! Task: build and program a ping-ping robot that will shoot ping-pong balls in various directions, ideally in a distance long enough so that it could be used to practice table-tennis playing. The first pointing device computer periphery was designed early after the 2nd world war. It was a kind of trackball (a rollable ball), patented in 1947 and used in secret military projects to control fire radars. 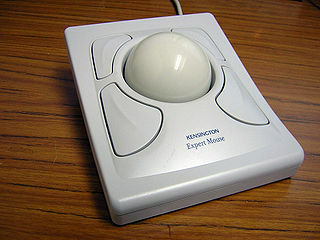 Figure: A trackball, source: Wikimedia Commons. The computer mouse, in the form we know today invented Douglas Engelbart in 1963. Various other pointing devices have been developped later on (trackpoint, pointing stick, touchpad, stylus, touchscreen and other). You may know joystick, which can also be used as a pointing device, designed already back in 1926 for the first time, but we will leave joystick outside of this task, and save it for another opportunity. 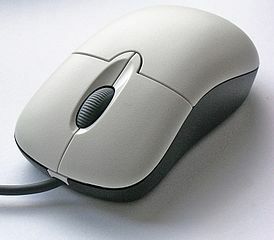 Figure: a computer mouse, source: Wikimedia Commons. Task: Using the parts of the LEGO MINDSTORMS robotic set, build a working model of a computer mouse or a trackball. Demonstrate its usage on a simple example out of your creativity - make sure that it is evident that the device is able to detect motion in an arbitrary direction and that it will decompose the movement to its components along the x- and y- axes and utilize this information in a useful way. Of course, for the ball, you may use some non-lego part ("a ball").